The Tombs opening line: The barbarian equipment was enormous, a great city that moved from place to place at whim of its unquestioned leader, the High King. It’s a prize beyond imagination. When an archaeologist excavating a top secret historical site realizes the magnitude of his discovery he requests help from treasure hunters Sam and Remi Fargo. And in rushing to join him, the husband and wife team are thrown into their most daring quest to date. The clues point to the hidden tomb of Attila the Hun, the High King who was reportedly buried with a vast fortune of gold and jewels and plunder, a bounty that has never been found. But as Sam and Remi piece together the puzzle, the trail takes them through Hungary, Italy, France, Russia, and Kazakhstan and not to a single tomb, but five. And into the path of deadly danger. They are not the only ones hunting for the High King’s riches. The Fargos will find themselves pitted against a thieving group of amateur treasure hunters, a cunning Russian businessman, and a ruthless Hungarian who claims direct descent from Attila himself…and will stop at nothing to claim the tombs’ riches as his own. Packed with heart-pounding action and boundless invention, The Tombs is an exceptional thriller from the grand master of adventure. I love historical dramas and this one is a fantastic read. We follow the path of the Fargo’s, a wealthy American couple, as they trace the treasure tombs of Attila the Hun. Not only is the book a real page turner, it is full of interesting facts. I am so determined to take a trip back to Rome to explore the catacombs after reading this book. 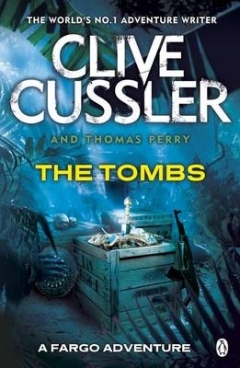 Written together with Thomas Perry, Clive Cussler has once again given me a perfect read. I can highly recommend that you buy this book, and the others in the Fargo Adventure series, which I will be on the lookout for. Disclosure: I was sent the book to review by Penguin Books South Africa. I was not required to write a positive review. This disclaimer is in line with my blogging policy. Oh, Tandy I haven’t read Clive Cussler for ages – will read it soon – after food and cooking reading is my biggest passion – can’t survive if I don’t have a book on hand.